How exactly does it feel to go to a place such as a super market or a public office, protected by security cameras? Quite awkward, isn’t it? But you would agree that as uncomfortable as their presence makes us feel, they really come handy in certain critical situations, such as an accident or a robbery. They can provide 24/7 footage whenever there is a call for an investigation. So when the idea of an invasion of privacy is weighed against their ability to discourage people from committing crimes and to nail down the culprits, their benefits usually outweigh their disadvantages. Is there something in YOUR life that is truly precious and that you would want to be ultimately protected and kept away from harm? Think hard. If you are a parent, it would probably take less than a millisecond before it flashes in your mind. Yes, that’s right. Your children! After all, they are the treasure you cherish the most. However, the irony of life is that no matter how much you shadow them to save them from the sad and bitter realities of life, they seem all the more persistent in heading towards them. They want to explore the world on their own. They want to meet new people and build relationships. They are never content with what they have and are ready to go to great lengths to get what they aspire for. They are ambitious and overly optimistic. They are not at all mindful of the pain and hurt that may befall them in their reckless journey. In fact, it seems that they are bent upon learning the lessons of life the hard way. As a parent, the thought of your child fishing in dangerous waters is too much to bear. Remember the first time your child learn how to ride his/her bike. At first, you were reluctant to let go of the fear of him/her getting hurt. But then you had to. And then you saw them fall for a couple of times before they learn how to ride it swiftly and smoothly. The same holds true for other situations in life as well. You would be the one knowing that there are cheaters, liars and predators out there waiting for your child to walk into their trap. But ultimately, you would have to let go and allow them to see the truth for themselves. There would be hurt, regrets and failure in their lives but to experience something oneself is the only way to learn it for life. But wouldn’t it be wonderful if you could loosen their ropes and be watchful of them, at the same time? Of course, it would be. Why burn yourself out in anticipatory anxiety when you can keep an eye on them, wherever they go? Why worry yourself, imagining if your teen really attends his/her lectures at a college or what kind of friends he/she makes or what are his places of interest that he/she likes to hang around with his peers, when you can be on the go with them, anytime and to any place? You might think it’s some Disneyland fantasy, but TheOneSpy has actually made this dream come true. If your teen carries an iPhone, an Android smartphone or a tab with him/herself, you can monitor what’s happening in their surroundings, anytime you wish to, with the latest TOS Spy cam feature. Want to find out how? Read below to find out. If you subscribe to the TOS Xtreme package, you would be awarded a control panel studded with some excellent state-of-the-art features. Control panel is your personal online account from where you can monitor your teen’s cellular activities and sometimes, their whereabouts too. To sign in to your account, you would be asked to insert your credentials, including a username and a password. These credentials can be extracted from the welcome e-mail, sent to your e-mail address shortly after your payment for the TOS license has been verified. So much for the process. Now that you have stepped into your account, you can see a number of features in the user MENU. Click on Bugging. A table will drop down, showing options for Mic bug and Live Snaps. Press the button for Live Snaps. You would be routed to another page. Select whether you want to capture a photograph using the Front or Back camera of your teen’s phone. As you make the selection, the target device will stealthily capture a quick snap, that will be uploaded to your dashboard. So, whether you are on a lookout for your teen’s lifestyle habits such as the use of cigarettes or drugs or his/her companions at school and beyond or the places they visit most frequently, TheOneSpy would be your friend in need. And as the common proverbial saying goes; A friend in need is a friend indeed. 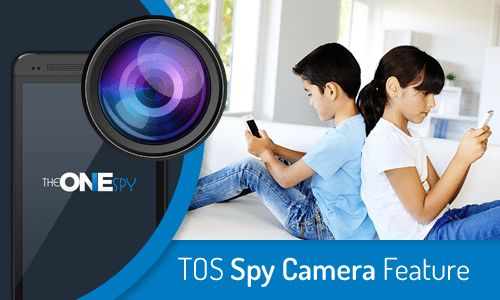 If your teen carries an Android smartphone or any android tablet with him/herself, you can monitor what’s happening in their surroundings, anytime you wish to, with the latest Spy cam feature of TheOneSpy.